Currently we have our Pottery Barn Darby rugs in Mocha… so pretty right??? But, I want to go blue or I want to go bright - well I’m about to share the images that are currently whirring around in my brain… and where I am in the process. I shared a post about all the different rugs in the Chalet last July entitled Rugs Rugs Rugs!!! I love mixing different patterns. Ok - could you just die? This rug - this pattern - this blue… with the light colored couch. This is so where I’m headed with the Chalet. I love love love this look. We do have a challenge with the layout of the chalet. The Livingroom and Den side of the first floor measure: 24 feet in length by 10 feet wide… but, when you minus the space for the radiators and the fireplace surround you are left with about 8 feet by 23 feet. This is a tall order; and since our last name doesn’t happen to be Rockefeller custom is not something we can well afford; that’s why we currently have 3 separate rugs all the same pattern - one 8 x 10 and two 8 x 5 spanning this side of the first floor. And this may be where I end up again… and I really want to span to at least 22 ft.. there is too much bare floor by the television cabinet. Ok but, before I go down the path of retailers both brick and mortar and on-line… let’s peruse the lovely pics that have been keeping me up at night! haha!!! Oh and I want to mention I think that Erin’s rug is a nice balance to our current Diningroom rug from Morocco. Cream base with pattern. In my minds eye… done right… find Erin’s rug. I love the woven textured Emily A. Clark has in her living room. I know at this point you’re thinking - wait… you like Erin’s rug and now you like Emily’s which direction do you want to go in? Well friends there in lies the rub! I like a lot! 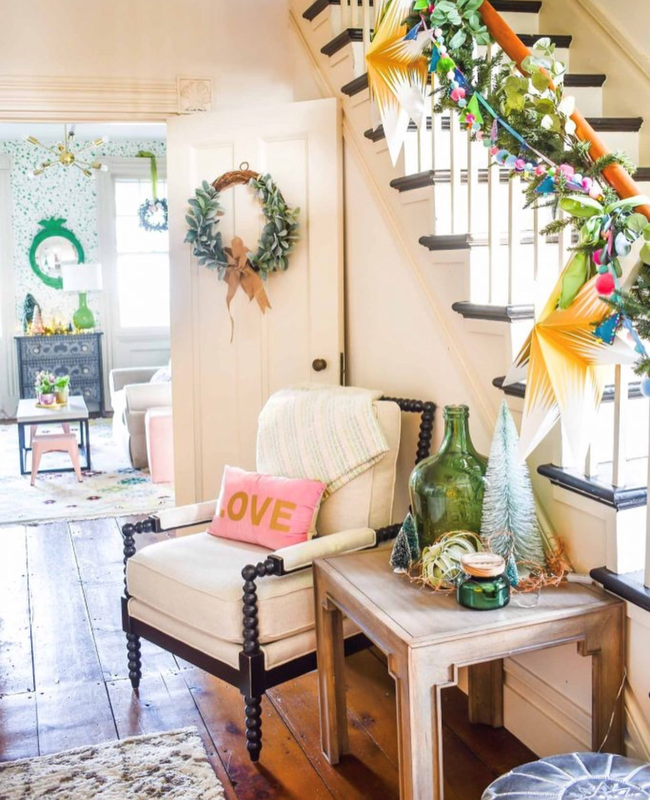 I also love this look at Erin Conway’s home. Sarah Hart is blowing my mind with her design for a century old home she and her family moved into last month. Look at this - modern with old world beauty. Her mix is amazing! This simple geometric pattern is the perfect compliment to Nicole’s beautiful decor and has the wheels turning in my head! Then we get to the lady with all sorts of crazy inspiration… Charlotte Smith has so many lovely floor coverings in her home… each unique and statement making. I love it all. Totally shifting gears we get to the distinctive rugs in the homes of my friends Bev Wilson above and Tiina Treasures below. I mean these are gorgeous old rugs that have history and luscious colorways. I love this lovely runner in Jen Dulac’s living room. The colors simply say HELLO! I fell hard for this blue and pink gal… on Christmas day… while chatting with my Mother In Law about what I was working on and sharing images and ideas. But, I have to heed her warning not to get something that will not work well with the Diningroom rug. Otherwise I will be getting a new rug in there too and honestly I don’t want that. If you follow me on Instagram than you know of my love of Home Sense. 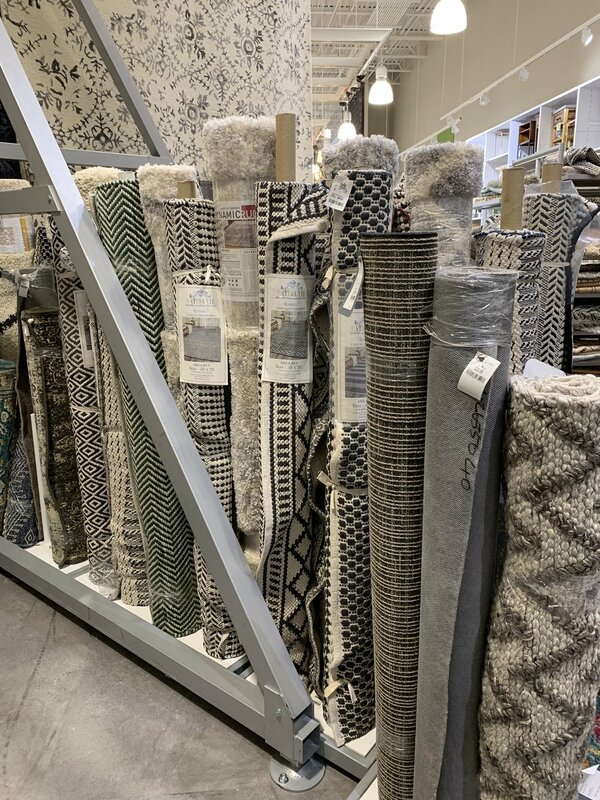 While out shopping for new lamps for the Diningroom I couldn’t help but, take a poke around the rugs… and what lovely options they have. And while the Old Meryl who loved a more jumbled look would have thrown caution to the wind and bought this lovely number below… I mean look at these colors - I mean YES. But, No friends… the point of this process, which started last July was to streamline the design and end up with a more sophisticated less cluttered look and bringing home a random albeit beautiful 9 x 13 wool rug at the crazy good price of only $399.00 would not have gotten me to my ultimate goal. So the search continues and I have to sell my Darby rugs. I’m learning even if we like something that doesn’t mean it’s suppose to come and live in the Chalet. I was Intrigued by my Top Nine Instagram Images of 2018. It’s so interesting why some images get a lot of hearts… Ok let’s dive in! Everyone loves a good Nutcracker and this grouping was a big hit! This image was posted on Friday November 30th. The only Friday of the group. We know the Gram is not usually in love with the small or angled but, #9 it is! These two images show the before and after with our new Home Sense Coffee table! I had to share these in a grid image… a table change a different angle … a basket… Number eight was posted Monday October 22nd - I know a Monday right? Usually not a specifically high traffic day on the Gram. Number seven from Thursday August 23rd one of the three Thursdays that made the list. My kiddo decorating the Tree was definitely a goody… and I will tell you I didn’t do anything but, grab a few snaps of him on Saturday December 1st. This was the first Christmas he was fully involved decorating the Tree and NO I did not move one thing he placed. Our Cherry Blossom Tree from Saturday May 5th and this Chinoiserie Pumpkin posted Wednesday October 31st are both stunners and they got much love! This image is tied to a Chaletmomma piece shared Wednesday December 12th; I tagged designers and friends in the image whom I wrote about in the piece Holiday Decor Round-Up. 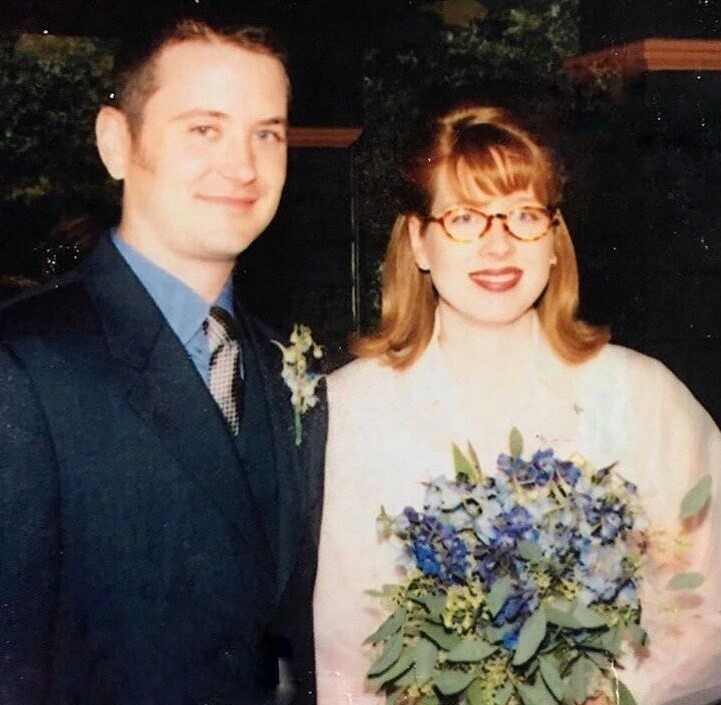 Our twentieth wedding anniversary was cause for quite a celebration! I posted this image Thursday October 4th. It’s funny that although my IG feed ( both of them) is about Decor and this is my second most popular image. I wish I knew why this image resonated so. Was it because everyone loves a wedding? Or was it because there were people in it? Are faces missing from my feed? Or were people happy to see a couple reach this milestone? Please leave me a comment - I’d love to know what you think! Well here it is! Number one is the porch I posted this Thursday May 24th. I invited friends to pop over to the Blog to read Galerie the post all about the transformation from outside galerie (what you call a porch in a Chalet) to our interior porch. I love this picture - the sun - all the lovely blue and white decor - the cow art and my fabulous Home Sense mid-century chair. This really is me from the ground up! I don’t follow any one point of view when it comes to decorating the Chalet! In writing this piece I realized there was one Friday, one Monday, two Wednesdays, two Saturdays and three Thursday - posts are on the list. So obviously Thursday is an important day for me and the Gram! I don’t know if this will change what I post or not… only time will tell but, I didn’t post on Monday this week too busy with this and that and maybe if I was going to skip a day it would be a Tuesday going forward… My feed is still so small so I feel a lot of pressure to post everyday to not miss an opportunity to connect with someone. I’m pretty sure if you’re here reading this post than you follow me. Hopefully you follow both Chaletmomma and SayNoToEmptyWalls. So here’s to you! To the fabulous community of friends that click that heart and spread joy! Christmas as we know is the most wonderful time of the year! This week in keeping with the Season I thought I would share some (OK a lot) images that really resonated with me! I must start the piece with this image from Emily A. Clark. I shared a link to it in last week’s post - this was the inspiration that led me to the Nutcracker display on my sideboard. What an all out showstopper this amazing garland is! To see more check out Room Sauce! How brilliant is this dark and dreamy space. Pop over to The Makerista and see her lovely home! The most wonderful bits of color abound at Charlotte’s house and in her busy life. Keeping with more color - how incredible is this lovely family room in Eddie Ross’s home! 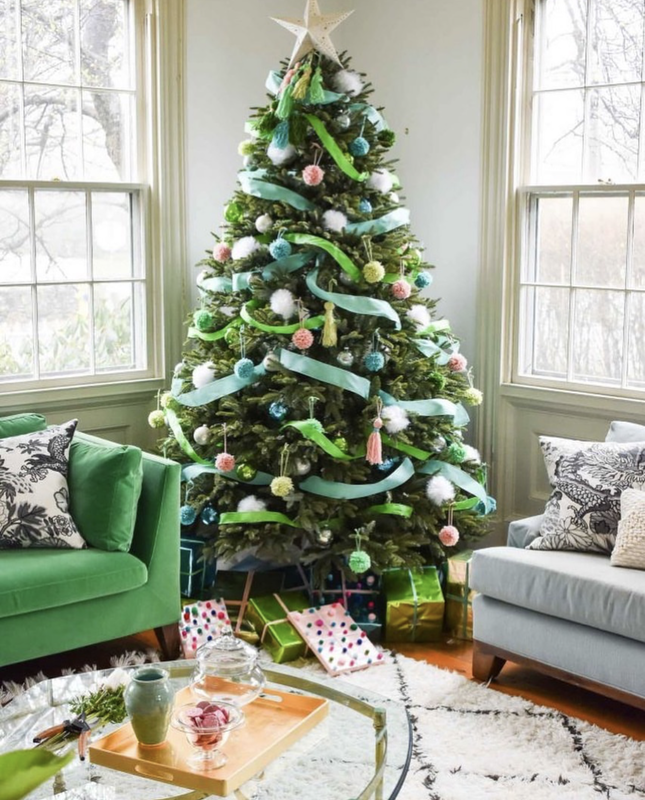 There is so much more to holiday decor than simply a tree or the traditional colors. Here are fun displays by Turner and Moss, Paige Minear and Kimberly Duran. Hayley of Mum Little Loves is a lady who’s design approach I admire so very much. Her blue and white home always leaves me gobsmacked! This mantel display is perfection! The simplicity by Monday Monday Creative is stunning! I am a huge fan of Nicole and her Sweet Domicile - her son’s room is so festive. I love carrying the decorations throughout your space and this is exactly what she has done brilliantly! Jo Galbraith has a delightful home full of comfortable pieces; beautiful colors - soft blues and greens. It oozes charm! This year she went with blue and white for the first time with great success - it marries back to her chinoiserie effortlessly! I will leave you with this stupendous image taken in London by The September Chronicles. I trust you enjoyed these image of the decor created or found by so many talented friends - maybe you’ve been inspired or maybe you’ve been introduced to someone new! I hope so!